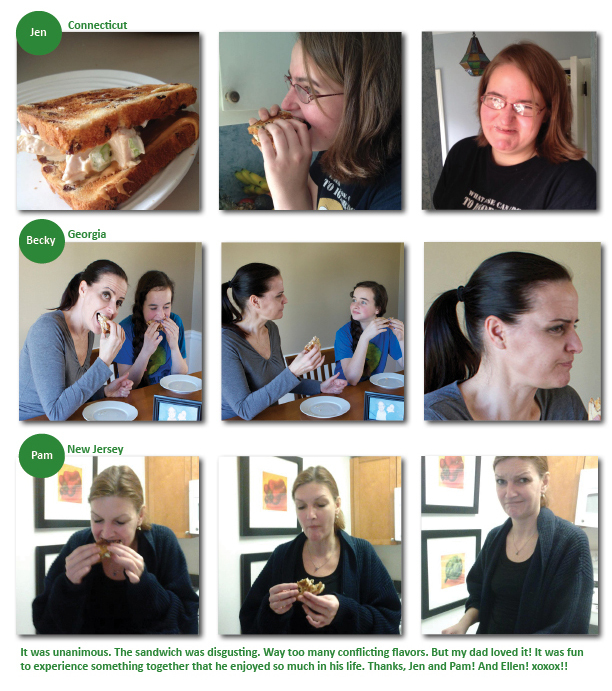 3 Sisters, 3 States, 1 Sandwich | Home Cooks Unite! I grew up one of four siblings in Freehold, New Jersey. My sister Jen is the oldest, and my brother Terry, born four years later, is the youngest. My sister Pam and I are smooshed in between. The older half, Jen and I, were born in Chicago. In the late 60s, my father took a job as an editor for McGraw-Hill in New York and we made our way east, moving into our house on Christmas Eve. Pam was born a month later, then Terry soon after that. My dad was an old dad. In the 70’s, most of my friends’ parents were my mothers’ age – in their mid-20s or so. My dad was 36 when Jen was born; 40 for Terry. He was born during the Great Depression. He told the best stories about how his family adapted to life at that time. Like how the City of Chicago didn’t have enough money for gas to bus children to school, so they set up trailers every few streets and let the children walk to class. Or how his mother would buy one roll of paper towels and make it last an entire year. My dad was also very smart. He skipped two grades in school and applied to college when he was just 16. He was accepted at Illinois Institute of Technology and majored in engineering, mostly to please his father. My dad often tutored young men who had returned from World War II and attended IIT on the G.I. Bill. These men didn’t have any money to pay him, so they would give him pencils and paper or other sundries they could purchase with their G.I. Bill money. I often pictured my 17-year-old father in the library, sheepishly accepting a ruler in return for help on some trigonometry homework. My father joined the R.O.T.C right before the Korean War broke out. Doing so positioned him for the primo assignments. He spent the duration of the conflict protecting America from the mean streets of San Francisco, inspecting ships before they sailed to war. When the conflict ended, he returned to Chicago. I never learned why, but he signed up for dance lessons at a Fred Astaire Dance Studio in Chicago. This is where he met my mother. For all of his education and travel, my dad never developed a sophisticated taste for food. He blamed this on a weak sense of smell, the result of a chemistry lab accident in high school. Something about chloride or other toxic chemical burning his nose. 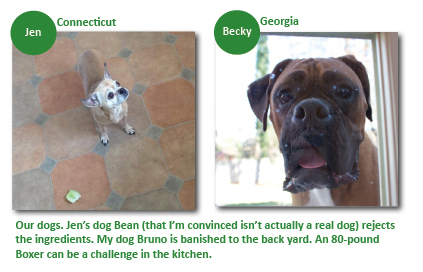 Either way, his food choices always perplexed us. He would commute to New York every day with a Ziplock bag containing his lunch. I remember peeking in it once. There was a sandwich, a piece of fruit (usually his favorite, a Bartlet pear), a Pathmark brand yogurt and a few Keebler cookies. Seems normal enough. Until you looked at the sandwich. The combinations were brutal. Liverwurst with peanut butter; chicken roll with mayonnaise and peanut butter; ham salad with extra mayonnaise and peanut butter. The bread choices varied. Pumpernickel, cinnamon swirl and English muffins all made appearances. He was famous for being a good sport about bread. A little bit of mold? No worries. He’d pick it off and use the slice just the same. He also used the bread butts, usually both for one sandwich. We chalked this up to him growing up during the Depression. My siblings and I teased him mercilessly about his sandwiches, but he didn’t care. 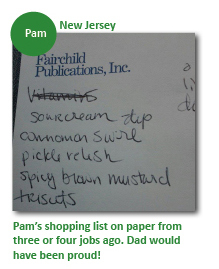 I remember watching him make his favorite one night in the kitchen – the ham salad/peanut butter combo. After spreading the peanut butter on an English muffin, he licked the knife, then lifted his shoulders and shook his head a little bit and said, “Mmmm!” The man loved his peanut butter. A little over a year ago, my dad, at 80 years old, started showing the effects of age. He still lived at home with my mother, but mobility had become an issue. He had started falling, and we were concerned about his well-being. After one particular fall, the doctor suggested he go to the emergency room and get checked out. Nurse: “How about a sandwich.” My dad lit up! The nurse calls downstairs and orders the sandwich. It was like an Abbot & Costello routine. Pam laughed the whole way home. His birthday is today, February 16th. He would have been 82 years old. My sisters and I thought we’d pay tribute to him by making the famous ham salad sandwich with peanut butter on cinnamon swirl bread. It was fun to experience this together. Using one recipe, in three different states, we shared something my dad enjoyed up until the very end of his life. I loved sharing this with them. So, here’s to you, Daddy! We love you! Place ham, mayonnaise, relish, mustard, and pepper in a bowl. Mix until well blended. Gently stir in chopped eggs. Serve on bread, rolls, or crackers. Makes about three cups ham salad. 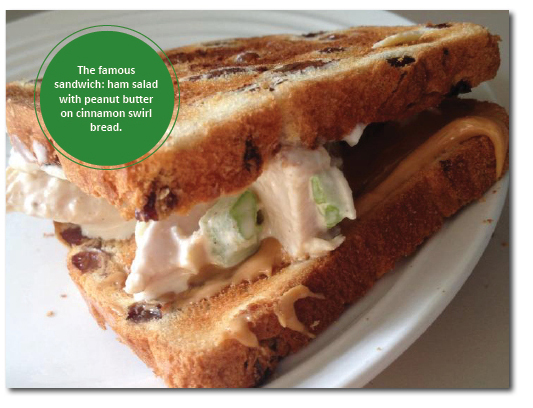 Cinnamon swirl bread and peanut butter optional! Thank you for sharing . . . it touched my heart. At lunch, I will have a sandwich but I won’t be so adventurous but I will remember Uncle Tom with love! What a great tribute to your dad and the memories you all share as a family! There must have been something about depression-era dads and their food. My dad would create the most obscene meals and snacks and we would all just shake our heads. But you have to love the creativity! Loved it but will not be trying this anytime soon. High Five to your father for raising such wonderful and interesting (with lots of good humor) children. Lovely tribute to your father…I thoroughly enjoy your blogs (even the ones I am not in). I hope when I pass my sons would remember me with a bit of my favorite meal wherever they are. I now have to make sure before I die that I narrow it down to just one favorite… for their sake that is. Put together with all of the pictures too . although not as adventurous as him . Loved the blog. This idea is novel. You are clever girls! I love this story, what a nice tribute to your family! That was fun. I remember your dad fondly. I too remember your Dad. So sorry to hear of his passing. Awesome tribute! What a fun post. It’s so nice to see you all pay tribute to your dad this way! I saw the link to your post on Pam’s fb and just knew I had to hop on over and read it.